Home eTutor How to HOW TO: Test If your TV Remote is Working using your Mobile? HOW TO: Test If your TV Remote is Working using your Mobile? Just in case you are wondering if your TV, DVD, Blue Ray or any other remote is working or not there is a very simple way to test it. All you need is a Mobile Phone with a camera. Just follow below steps to check if you TV remote is working or not. 1. Start your Mobile Phone Camera. 2. Place your Remotes LED sensor in front of your Phone Camera. 3. Press any button of yourremote. 4. If you see a LED light flashing your TV remote is working. 5. If Not you need to get it either repaired or replaced. Below is an example of how the experiment looks like. 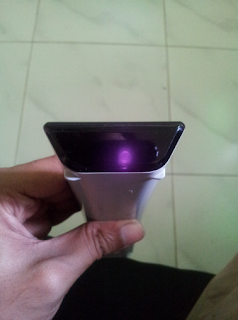 You can see the purple LED glowing in the Remote. If it does not glow your Remote is either not working or its battery is dead. Share this with all your friends as all of us have some remote or the other.